At the time of the World War II and the genocide of the Roma which has done great harm in Lithuania have left traces of the Roma memory. 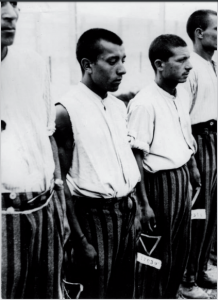 In 1942, Nazi Germany occupied Lithuania on the beginning of the mass detention of Roma arrests, they were transported to concentration camps and work in Germany and France. Approximately, a thousand Roma people were deported from Lithuania, and most of them came back. The Roma have been killed and in the territory of Lithuania. Most Roma were killed in Pravieniškės, as well as near Švenčionys, in Šalčininkai district. Evidence were found in documents, which show that the majority of Roma in Vilnius were killed in Kirtimai, and the number of victims is unknown. 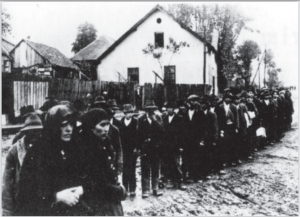 Nazi Germany’s occupation in Lithuania, killed at least 500 Roma, or roughly every third Lithuanian Roma. It is known, that Nazi killed families of Roma travellers which they meet on the road. However, it was not indicated in the reports and documents, and therefore supposed that this number may be higher. Each year, on August 2, the Lithuanian Roma non-governmental organisations commemorate Roma holocaust day. Together with the Department of National Minorities under the Government of the Republic of Lithuania is seeking to include the August 2 day among other memorable days. It is proposed in order to promote an intercultural dialogue, increase the openness and tolerance of the society of Roma culture, with a view to a greater integration, mutual understanding, public education about Roma culture and history. When “memorial stones“ were installed in pavement of J. Tilvyčio street, in Panevėžys, the city joined to the largest open air European memorial community. 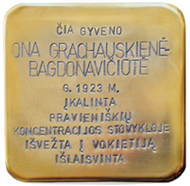 These “memorial stones“ became the 1st monument in Lithuania which shows the importance of the Roma genocide in the society. 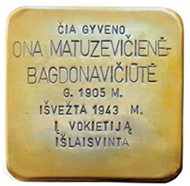 “Memorial stones“ are dedicated to Ona Matuzevičienė-Bagdonavičiūtė, Anastazija Jablonskienė-Matuzevičiūtė, Zosė Matuzevičiūtė, Oną Grachauskienė-Bagdonavičiūtė. 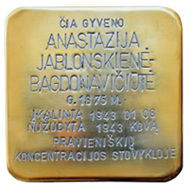 They will also symbolically remind all the Roma, who were tortured and killed during the Holocaust. 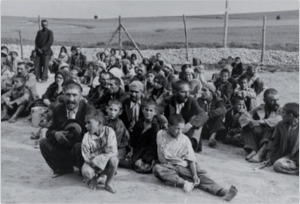 During the World War II, the Roma, the Jews, and how the Nazis were prosecuted for racist incentives – massacred hundreds of thousands of Roma, whose ancestors lived in Europe in the next generation of times. Lithuania was no exception. It is estimated that the country killed at least 500 people of Roma origin (it concluded one third of the community). At the end of the Nazi occupation, Roma were transported to France and Germany – about 1000 Roma were deported. In August 2, 1944 in Poland, Auschwitz-Birkenau concentration camp was destroyed. About 3000 Roma were killed. By commemorating this tragic day, every year it is intentioned to organize Roma Holocaust remembrance day. The Council of Europe publication “The Right to Remember” is intended to the Roma communities and the Roma in particular for young people further access to the Roma holocaust which, as a historical fact, has not been analysed in detail. International Holocaust Remembrance Alliance made a methodical material in which you will find a history of Roma holocaust. It is also intended to Roma communities to spread an information about this tragic historical fact. 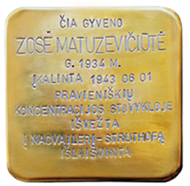 Methodical material on Roma and Sinti Holocaust. It describes the life of Roma and Sinti, discrimination towards them before the war, and the reasons for the Holocaust, concentration camps, surviving on live witnesses of history. Another methodical material on Roma Holocaust is written by OSCE organization. It describes ways to disseminate information about this event young people in schools, and provides information on the Roma Holocaust Memorial perpetuation in various European countries.